I fell in love with the gorgeous inspiration picture that Heather posted for this week's Timeless Tuesday Challenge on the Flourishes blog! 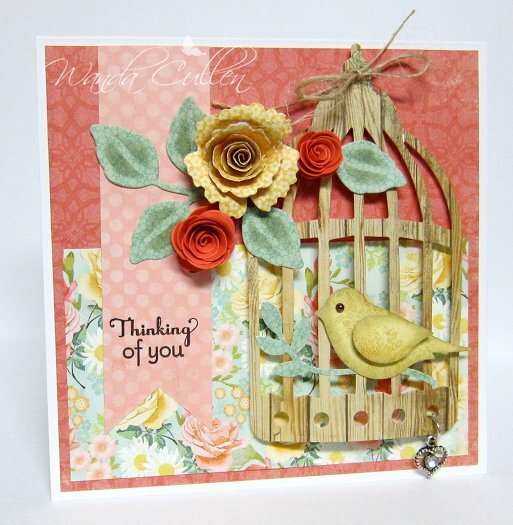 I chose to use the yellows and orange/peachy tones along with the greens for this card. I also loved the birdcage and twine elements of the photo, so included those as well. The layout is for Jen del Muro's March Sketch For You To Try...loved this sketch! These papers are all from MME's Miss Caroline "Howdy Doody" pad...gorgeous and probably my fave from their new line from winter CHA! What a lovely card Wanda! Love your take one the inspiration! All of the paper embellishments are so cute! Thank you for playing along at the FTTC. I just got this die and can't wait to use it. This is beautiful.